"I made these up for a friend who loves pumpkin. I looked at a few pumpkin pie recipes and tried to include some of the same ingredients. Here is the delicious result." Punch down the dough, and roll it out to a rectangle shape on a floured work surface until it measures about 18 inches wide and 26 inches long. Brush the dough with 1/4 cup melted butter. Mix the brown sugar with 2 tablespoons of pumpkin pie spice in a small bowl, and sprinkle the mixture evenly over the dough. Roll up the dough the long way, and pinch the seam closed, then cut the dough into 12 equal-sized pieces with a sharp knife. Lay the rolls into the prepared baking dish. Bake in the preheated oven until lightly golden brown, 30 to 40 minutes. While the rolls are baking, mix vanilla extract, cream cheese, 2 tablespoons of melted butter, confectioners' sugar, and milk together to make a glaze. Spread the glaze over the rolls as soon as they come out of the oven. 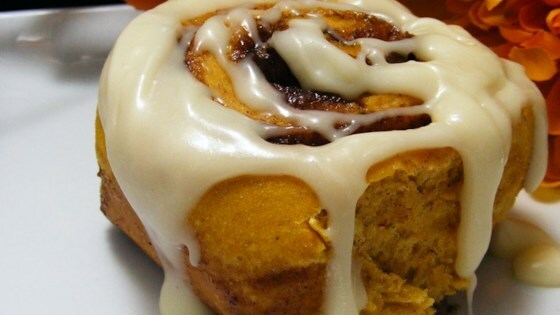 These amazing homemade pumpkin cinnamon rolls are scary delicious. If you would prefer a slightly lighter texture, allow the rolls to rise (covered) 30 minutes after placing in the baking pan before putting them in the oven.